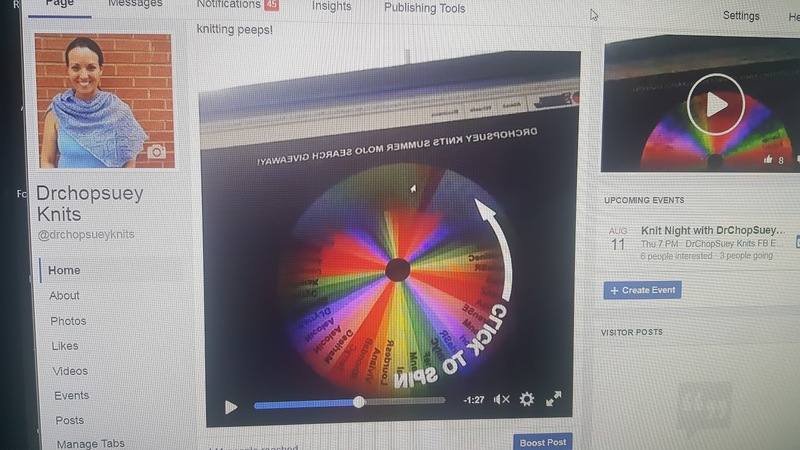 THANK YOU to all who participated in my first DrChopSuey Knits Contest! It's always a thing when you are not sure if anyone is going to join or play with you in your events - so it was so rewarding (and fun!) for me to see so many familiar and new faces join. And thank you for sending me (and each other) knitting inspiration - you guys are really awesome! It was also fun (okay, nerve wracking) to jump on Facebook live to announce the winner. In my first FB live post (on a different group) I didn't realize the camera orientation had to be vertical and not horizontal. So for the entire live post I was sideways! In this second FB live post I didn't realize the camera shows everything backwards! So I didn't realize my wheel and everything would be inverted! Doh! Maybe the third time will be the charm and I'll finally get the hang of this thing (probably not, but whatevs!). And a congratulations to Rebecca G who won! I was so excited to give away a prize - I think I might do another giveaway sooner rather than later! Finally, a reminder to all about my upcoming Virtual Knit night! I have no idea what to expect (or really what I'm going to do). So if you wanted to hang with me and other knitters (crocheters and other fiber artists are also welcome!) 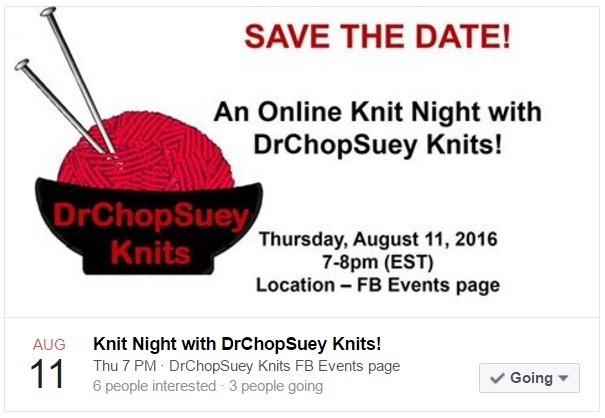 please join us on Thursday, August 11th from 7-8pm (EST) on the DrChopSuey Knits FB events page! Until next time - Knit and Rock on! !